Enjoy Bare Home premium ultra soft microfiber sheets for a comfortable nights sleep! These sheets provide long lasting vibrant color with a soft lustrous touch that can not be beat. Bare Home sheets with a deep pocket provide a secure fit on any size mattress up to 15 inches deep. Luxury bedding softness even softer than high thread count Egyptian cotton. Machine washable for easy care. 3 PC Twin Sheet Set includes one fitted sheet 39 inchesx75 inches, one flat sheet 66 inchesx96 inches, and one standard pillowcase 20 inchesx30 inches. 3 PC Twin XL Extra Long Sheet Set includes one fitted sheet 39 inchesx80 inches, one flat sheet 66 inchesx100 inches, and one standard pillowcase 20 inchesx30 inches. 4 PC Full Sheet Set includes one fitted sheet 54 inchesx75 inches, one flat sheet 81 inchesx96 inches, and two standard pillowcases 20 inchesx30 inches. 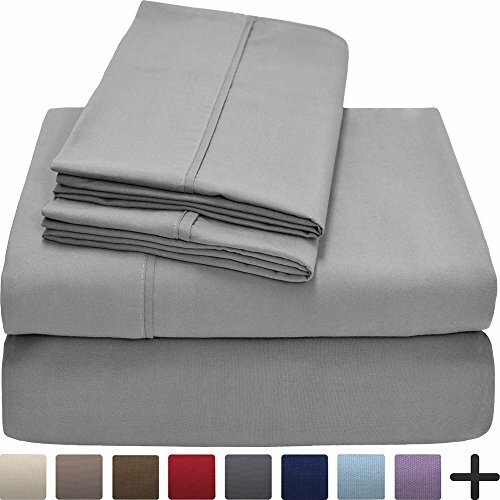 4 PC Full XL Extra Long Sheet Set includes one fitted sheet 54 inchesx80 inches, one flat sheet 81 inchesx104 inches, and two standard pillowcases 20 inchesx30 inches. 4 PC Queen Sheet Set includes one fitted sheet 60 inchesx80 inches, one flat sheet 90 inchesx102 inches, and two standard pillowcases 20 inchesx30 inches. 4 PC King Sheet Set includes one fitted sheet 78 inchesx80 inches, one flat sheet 108 inchesx102 inches, and two king pillowcases 20 inchesx40 inches. 4 PC California Cal King Sheet Set includes one fitted sheet 72 inchesx84 inches, one flat sheet 108 inchesx102 inches, and two king pillowcases 20 inchesx40 inches. 5 PC Split King Sheet Set includes two fitted sheets 39 inchesx80 inches, one flat sheet 108 inchesx102 inches, and two king pillowcases 20 inchesx40 inches. MAXIMUM COMFORT: 4 Piece King Sheet Set Includes: 1 King Fitted Sheet (78" x 80" x 15" pocket), 1 King Flat Sheet (108" x 102"), 2 King Pillowcases (20" x 40"). Expertly tailored fully elasticized fitted sheet with the durable elastic that goes all the way around the fitted sheet will snugly fit all mattresses 6"-15" deep!